In my artistic practice the whole printmaking process is an essential part of content or substance; but however, it is still printmaking. This insists to define the process with new concepts and thus integrate it to the expanded art field as contemporary art. When the idea is to take off the artificial borders around printmaking, to really understand the process, the conclusion is that expansions are originating consistently from the essence of printmaking. So the definition of printmaking is expanded and this expansion is based on real processes of printmaking. The process is collective, and I mean this in the sense of Bruno Latour, so all parts of the process are included to this collective as equals: presses, corrosive subjects, plates, printing inks, tarlatans, stones, rolls…..depending on what is under the process. The final print or edition of prints are only equal parts of this collective (process) which forms a net of mobile relationships. And it is possible to use in artistic practise parts of this collective simultaneously. So from the point of view a single print is also a collective, co-operational, part of mobile relationships. Try-outs to understand the process, which is always based on code and transformation, give new possibilities. The code is monochromatic, black/white or transparent, material half tone, generally, and nowadays often digital. There is no crucial difference in this meaning between the tradition and contemporary. The code forms the matrix, which can be material or immaterial and the “print” can also be material or immaterial. In the Printed there is constituted spatiality between the matrix and the draft, and it is always there. Print is indexical, it is in direct relation to the matrix, but indirectly in conceptual relation to the reality. The matrix can exist further after printing, it may be destroyed or merged with the print. Barthes speaks of a photograph as a trace from the past. I think one might think that print is only one half of the wholeness, in which we do not see the matrix. There is born a multi-level mode inside Printed matter, which is deeply conceptual. We feel the longing for an unknown, which we can only see as the imprint. This gives rise to melancholy, longing for the matrix. Visual delight will follow and is secondary. The relationship between matrix and print is like a projection. If we realize the printed as a polar way of thinking, a projection, which is in the core of printed, it opens up new strategies to printmaking as contemporary art practices. The polarity between the matrix and the print occurs with countless ways in the spatial distance. Polarity may be expressed in many ways, in many states. It can be a referent, a presence of a causal consequence, an index, a focus and a performance, a limit state, a temporal transition. It would be possible to think that the matrix transmits information, data. Use of the word transmission gives a hint of spatiality, which is flexible, infinite and conceptual. The material matrix is followed by melancholy – but is it possible to think digital, immaterial, matrix as something almost non-existing? Even though there is code, inner structure is like projection, it is flat, merged and not spatial in the sense of material matrix. And that’s why the digital is more ordinary, in the lack of melancholic dimension – and surface, visual delight gets more importance. Edition, multiplication, have considered the way to be democratic. The concept connected with printmaking originates from seventies, the strategy failed, because during the years it lost content and conceptual layers and pushed out printmaking from contemporary art field. Edition without purpose, as such, is meaningless in the light of content. In digital universe multiplication is meaningless, because everything can be transmitted and shared, thorough different platforms. So printmaking is rather participatory than democratic. Päivikki Kallio, 1952. Visual artist, printmaker, since 2010 professor in printmaking in Finnish Academy of Fine arts /Helsinki Art University. Kallio has studied philosophy at the University of Helsinki, graphic design at the University of Art and Design Helsinki and printmaking at the Eesti Riiklik Kunsti-instituut. 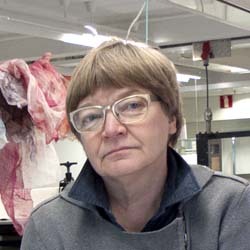 She has exhibited her works extensively in Finland, Europe, the United States, and Canada. Kallio’s artistic practice experiments with the foundations and borders of printmaking by working with different materials. The print in her work may be found as a shadow or reflection on the wall or printed or sandblasted on different surfaces. Since 1990 Kallio’s artworks have been mostly installations in space, based on printmaking concepts and processes. In her works, Kallio has examined the themes of childhood, family, history and memory.